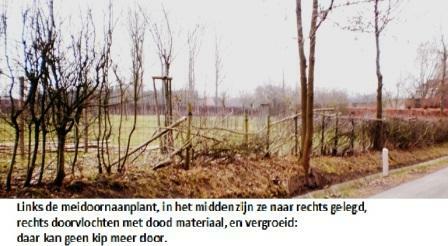 Hedges serve to protect and keep livestock in, and unwanted visitors and robbers outside. Our virtually impenetrable pleached hedges were to the Romans notorious obstacles. The braiding utilizes the natural response of the bush to always go to the light and to grow upward. Approximately 4 to 8 years after planting of shrubs should be bent, or the bushes are just above the foot with an ax, machete or saw partly cut in and laid in one direction or alternately placed in alternated direction (the ‘laying’ or plashing). Thorny hawthorn, blackthorn and bramble, but also hazel were used for this purpose. A meadow hedge was used, just like those around a garden, to keep cattle out. Good pasture was for winter hay. During the day, shepherds brought the animals to savage borders and communal lands to find their food there. The hedges had to keep the herds out. Our maple is native Spanish barge or Field Maple (Acer campestre), a pioneer who is also interesting for bees, hedges and coppice. He is pruned in late autumn, in the spring he 'bleeds' too much. The bark won’t get not off, leaving traditional branches for perching (with a good grip) used for poultry pens. Hedgerows provide shelter and warmth, and protection against desiccation and erosion. Nearby is the crop yield fewer but even more from 20 meters. Optimal seems a spacing of 250 meters, which (in the square) represents plots of 6 ha. Right a guideline for the maximum contiguous area for a monoculture. In 8 - year rotation on plots of 5 ha, 40 ha field is required (for one worker). Vegetable crops can make yield fields more interesting (but also sometimes more labor intensive). 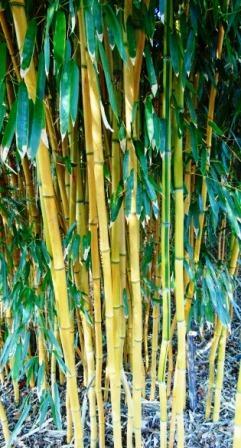 There are hardy bamboo species that provide 2-3 meters long stems suitable as wicker, beanstalk, stick support for tomato plants, peas, pickles etc. Cut them above a node, so that no water stays in the remaining stump. (Phyllostachys aureosuldata var. Aureocaulis, P. nigra, P violascens, P. viridiglaucescens, P. vivax, Pleioblastus simonii, Pseudo japonica, Semiarundinaria fastuosa, Yushania anceps and Y. maculata).